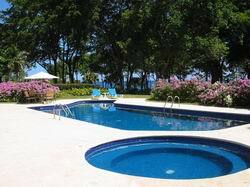 Sosua Luxury villa for sale in the Sea Horse Ranch community on the North Coast of the Dominican Republic. Luxury Villa for sale in exclusive Sea Horse Ranch. 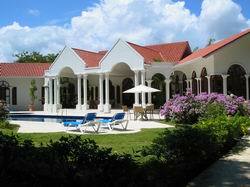 The villa is within the exclusive gated community of Sea Horse Ranch just fifteen minutes from the Puerta Plata Airport. La Casa De Las Flores is an ocean view luxury villa located on the north coast of the Dominican Republic, which shares the island of Hispanola with Haiti. The villa is located between the towns of Sosua and Cabarete. The tranquil town of Sosua enjoys a beautiful horseshoe bay with a white sand beach and calm waters ideal for swimming. Cabarete is a lively internationally renowned wind and kite surfing center as well as hosting many good restaurants and gift shops. La Casa De Las Flores was designed to take full advantage of the ocean view that can be seen from the pool terrace, the shaded oversized terrace off the living room, the living room itself, the formal dining room and the master bedroom suite. A private cove beach is located approximately 40 yards from the villa and a few yards beyond that are the communal swimming pools for the exclusive use of guests and residents of Sea Horse Ranch. Among the other amenities available within the community are The Beach Club which is a restaurant located on the ocean just a few yards beyond the communal pools; five hard tru tennis courts with two lighted for evening games, ball boys and a tennis pro; and an Equestrian Center where guides and horses are available to explore the beaches and country side, beginners welcome. There are two Robert Trent Jones golf courses in the area, one to the East at Playa Grande much like the famous Pebble Beach Club and another to the West at Playa Dorada. In addition, plans have been completed to build a golf course next to Sea Horse Ranch and membership will be open to Sea Horse Ranch homeowners.